The dining room has always been the meeting point of family members. Its importance can never really be undermined. A cheery, vibrant-looking and aesthetical dining room makeover help you to alter the mood of your family and even get compliments from guests. Contrary to popular beliefs, you need not break the bank to redo your dining room from boring to chic. While the thought of remodeling any part of your home can seem pretty daunting at first, there really are a few ideas and inspirations that you can derive from to achieve an impressive makeover. 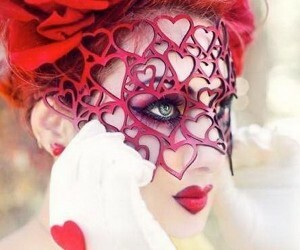 Here is a compilation of amazing transformations that you can use to gear up for your own makeover project. These Easy And Budget-Friendly Dining Room Makeover Ideas are doable even for the most layman home owner. Lack of personality and detail was quite evident in the dining room prior to the makeover. However, a little touch-up with pastel colors and the addition of a salvaged wood-crafted table, blue plastic chairs and a dramatic patterned rug, lend character to the otherwise bland and empty room. The crystal chandelier seems quite an appropriate replacement to the wrought-iron chandelier as it blends well with the white ceiling and brings a blissful aura to the whole picture. via designingvibes. This spectacular dining room makeover is the ultimate testimony to the wonders that a mere color-contrast can do to a room. Earlier, this room certainly didn’t deserve a second glance, with its odd-styled cupboard, hardwood flooring and dark wall paint. However, the incorporation of floor-length curtains for the windows and sparkling new paint for the cupboard and walls make the room look airy and inviting. The ferns peeking in from behind the cabinet add a rustic charm to the otherwise urban look of the room. via designingvibes. This pristine-looking dining room in white looks like it has undergone an evolution from serious to clean and bright. The transformation is no doubt impressive. The white walls, the cabinet stacked with Chinaware, the vintage brass candle holders anchored on either side of cabinet and the stylish chandelier all make the room perfect for a Sunday brunch with friends. via savvysouthernstyle. What once was a bland and basic dining area became a gorgeous French-style country cottage, with furnitures and glass chandeliers for the ceiling. The dark floor forms a striking contrast to the pastel colored chairs, while the useful clutter on the wooden dining table add warmth and character to the room. The scribbled blackboard in the center is what first catches the eye, and lends a lot of shabby-chic charm to the place. All in all, one of the most easy and budget-friendly dining room makeover ideas for people who find contemporary decor boring. via frenchcountrycottage. This dining room makeover idea seems perfect for the complete bookworm who hates to ignore his book even during dinner. The massive bookcase set against one side of the room allows stylish storage of all sorts of books, collectibles, potted plants and even a pretty little table lamp. The black chairs that surround the hardwood table give a striking contrast to the soft blue hues on the white floor, while the round table softens the harsh right angles of the dining room. via thriftydecorchick. Red and wood were the first things that one would notice about this dining room before the makeover. However, after the transformation, the room looks dramatically different and appealing, with its new laminate flooring, sparkling baseboards and the refurbished faux board. The glass chandelier further adds to the detail, while contrasting with the polished white finish on the decor. Potted plants and flower vase on the table stand out well against the plain background of white, and give the room a cheery feel. via akadesign. Who knew that a simple change of wallpaper could make a room look practically unrecognizable? Well, this picture lies proof to this fact. If you start by spotting the differences, you will find that apart from the dark-patterned wallpaper, not much has been changed to achieve the transformation. After the makeover, the room looks bright and casual, with its honeycomb-pattern white wallpaper, glass chandelier and matching white flower vase on the table. via thelilypadcottage. The homeowners decided to refurbish this dining room after spotting termites behind the dining room walls, but little did they know that a small change here and there would beautify the space completely, giving it a soft-toned and charming feel. The hardwood table and chairs create a natural look, while the upholstered large chair at the corner makes the setting ideal for family gatherings involving the eldest member. However, it’s the patterned floor mat that takes away all the points for its quirky prints and mild orange shade. The white panels on the walls are notable too and create a serene mood so lacking in the high-brow dining room before. via heatherednest. 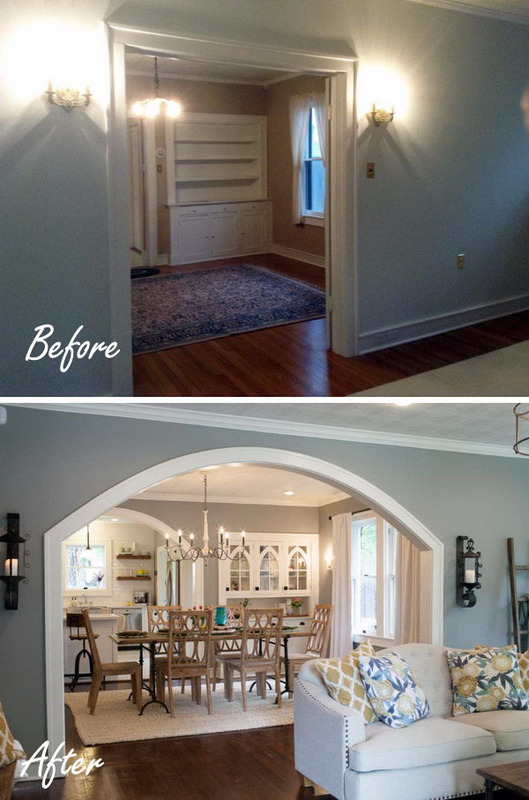 This space-constrained dining room in wood and white paint looked like it had a great potential before the makeover. After the transformation, however, the space looks completely different and not at all congested, with an upholstered armchair, settee and two cane chairs for the hardwood table. The blue cushions match the satin blue curtains anchoring the elegant French window, while the black photo frames blend strikingly with the eye-catchy chandelier in black and glass. An array of decorative candles set in the flower box adds a lot of color to a plain, wooden dining table, while the heavily embroidered rug makes the room best for cozy dining sessions in winter. source. This dining room redo idea helps you understand the wonders that white and curtains can do to a space-compromised room. Earlier, the dining room looked no doubt beautiful, yet the lack of space was clearly evident. After the makeover, the room looks bright and spacious, thanks to floor-length, stylish curtains, contrasting the glossy white walls and the frilly, handmade chair covers. The custom-made lampshades anchoring the mirror adds detail to the room, while the patterned floor mat in pastel blue adds a rustic charm to a contemporary dining area. via cedarhillfarmhouse. 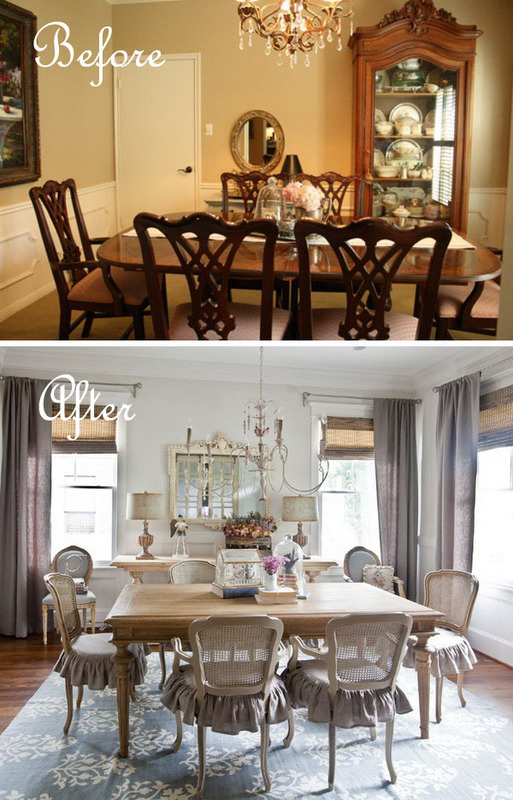 Nobody knew that an airy, spacious and elegant looking dining room would ever need a makeover. Yet, in this picture, the dining room seems to have benefited quite a bit from the makeover. The elephant-grey walls contrast well with the stark white French windows, while the printed curtains reinforce the warmth and depth of the space. The addition of upholstered furniture and a quaint white bench makes the room ideal for late-night chat sessions as well as a space to play board games. via cityfarmhouse. The best way to create the illusion of space in a room is by using suitable color-contrast. 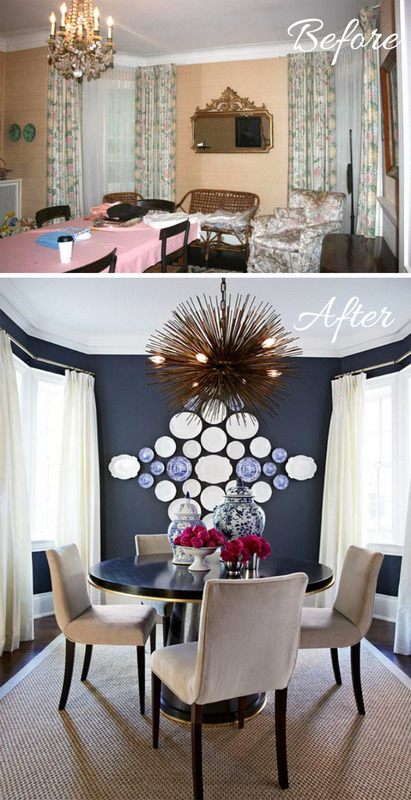 This space-constrained, blue dining room looks airy, cheery and appealing after a makeover. The black table and salvaged-wood chairs form a striking contrast to the white curtains with black prints, while the arrangement of Chinaware and flatware on the grey wall add detail to the space. The vases of plants set on the table add a natural look, while contrasting beautifully with the white surroundings. via drivenbydecor. This dining room makeover idea is extremely budget-friendly, and requires no more than a slight upholstery for the chairs, a pair of potted plants for the table, a classic, antique chandelier and a dramatically colored floor mat. A combination of white, royal blue and wooden shades do the trick to transform a boring and bland space to a lovely room with lots of personality. via thistlewoodfarms. Prior to the makeover, the dining room sure looked elegant, but with nothing to catch the eye. Now, thanks to the transformation, the room exudes a contemporary charm with its pretty patterned wallpaper and upholstered large chair, creating a catchy contrast with the royal blue rug on the floor. The chic chandelier and the clutter of white plates set against the pretty wallpaper make for great conversation-starters! via thistlewoodfarms. The main idea behind this makeover is to tone down the high-brow and harsh appearance of the dining room. Sure enough, a combination of white paint for the walls, upholstered chairs and wood table soften the overall appearance and make it more elegant and feminine. The brick wall stands as the focal point of the room, adorned by a fairytale-inspired mirror standing among a semi-circle of white Chinaware. The potted plants on either side add color to the mild background, while the asymmetrical chandelier creates contrast against the polished white windows. via homestoriesatoz. This spacious dining room has been transformed into a Country-inspired seating area with some upholstered furniture, a nautical chandelier, an elegant round table, and a clutter of Chinaware and flatware stacked in a blue cabinet. The woollen rug on the floor matches the white cover on the chairs, while the lace curtains anchoring the French window makes for an airy feel. via blesserhouse. This newly painted dining room with wood flooring looks like the perfect starting point for a dramatic evolution into a more impressive area featured with colors and details. Indeed, after the transformation, this empty and basic space looks quite unrecognizable with its glossy white walls, cane chairs, upholstered big chair and an oddly-shaped white rug on the floor. The iron chandelier has the potential to become the talking point, with its grand appearance and catchy color display. via source. A simple change of paint can do wonders to a room and there’s no better example of this statement than this dining room makeover idea. A heavy-duty and serious-looking dining room has been given a casual and contemporary look by a simple white painting on the walls and furniture. via refreshrestyle. 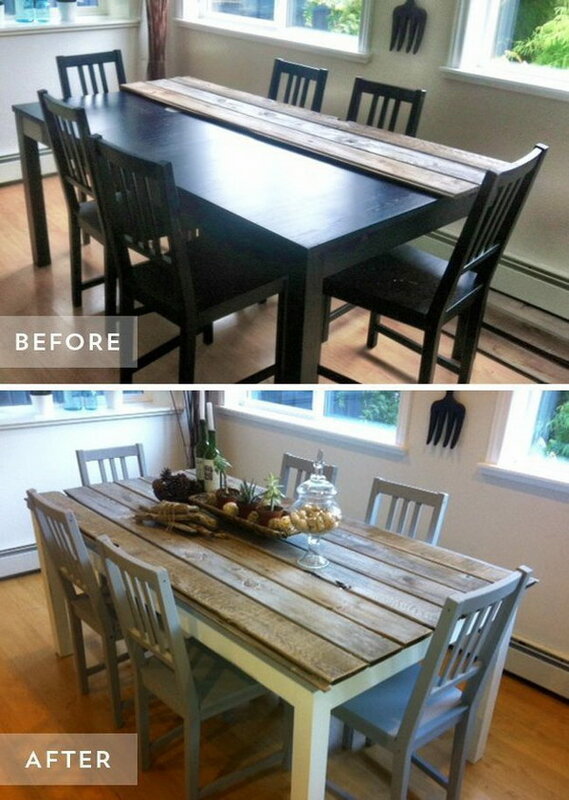 This cost-effective DIY dining room makeover idea seems perfect for nature-lovers. A row of wooden shelves stacked with cages, baskets and white plates blend beautifully with the wood floor, table and chair set. A clutter of fruits and potted plants kept here and there add a dash of color to the otherwise plain appearance. All in all, the space has a simple yet catchy charm after the makeover. via thewoodgraincottage. A white painting on the walls, addition of white cabinets, upholstered chairs and an black table make for a gorgeous, as well as urban remodel of a 70’s style dining room. A tiny flower vase kept here and there lend a beautiful aura of elegance to the room. via mariannesimondesign. Who knew that upholstered chairs in soft hues of blue could literally transform the look of a dining room? And yet, it’s true as is evident from this makeover. The only notable change between the before and after pictures is the chair set used. And the result is no doubt quite satisfying, considering that this makeover idea costs little in terms of time, money and energy. via brandisawyer. Before the makeover, the room had a spacious and cheery presence, with its patterned walls and French windows. Yet, it lacked personality and detail. After makeover, it carries an elegant appeal, thanks to the cane chairs, hardwood table, white shiplap walls, and iron chandelier. The shelf on the wall adds detail to the plain room, with its array of collectibles standing against an array of photo frames. via sypsie. 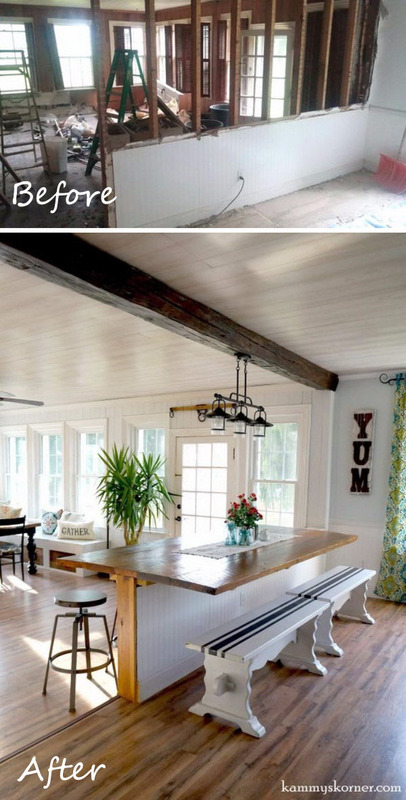 This dining room has a pleasant, country-cottage feel after makeover, with its white plank walls and a blackboard grabbing all the attention and space in the center. A circular string of leaves carelessly adorning the board adds a rural charm, while the decors placed below create the illusion of detail. via thewoodgraincottage. This dining room looks pretty grand and royal after makeover, with its rustic wood table and bench, floral decor on the walls and the white Chinaware set here and there for a high-end look. What’s most appealing about this room is the interplay of colors and the way different shades of black and white has been manipulated to create an elegant effect. via roomsforrentblog. This custom-made breakfast bar seems like the perfect spot to enjoy your delicious food. The tall, white French windows are so pretty, while the long wooden table set alongside the white benches and a wooden stool looks like a great ice-breaker and conversation-starter for guests. via remodelaholic. There is not much to highlight in this dining table makeover idea, except for the table. The addition of wooden planks on the salvaged table really does the trick to make the room look more charming and inviting. via flutterflutter. This high-end dining room makeover idea is perfect for creating a luxurious haven out of rubble. Prior to the transformation, the room looks cluttered and bland but with a lot of potential. Post-makeover, it’s almost unrecognizable with its intricately carved chairs, open kitchen area, wrought-iron sconces anchoring the rounded entrances as well as the chandelier. via hgtv. The principle colors used for the makeover of this dining room is black and white. The hardwood table and chairs, the bold black chandelier create a contrast with the grey walls and the white curtains, while the black-framed French window seems quite like an attention-grabber. 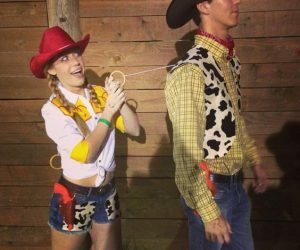 via inspirationformoms. The idea behind this makeover is surprisingly simple: a change in color theme. For the makeover, a white paint has been used for the walls, ceiling and chairs to lighten up the overall look and help create a visual interest, while maintaining the same amount of utility. via studio36interiors. A conventional-looking dining area has been given a Gothic feel with black paint on the walls contrasting the glossy white chair and table set. The red glass chandelier accentuate the Halloween effect, while the quirky art on the walls create a modern vibe. via theshabbycreekcottage. 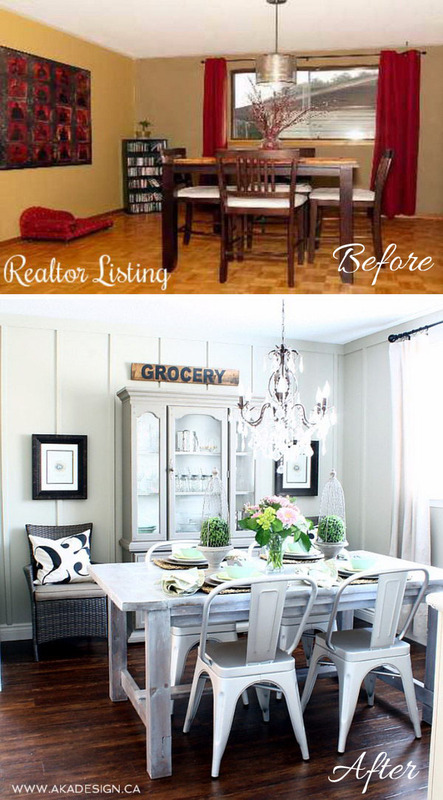 This budget-friendly makeover idea is for those who wish to make their dining area less cluttered and more casual. The midnight blue paint on the walls contrast amazingly with the white and floor-length curtains, while the upholstered chairs surround the round table on all sides to exude a cozy feel. The assortment of white Chinaware on the wall has a shabby-chic appearance and the crafty chandelier adds color to the room. via marcusdesigninc. This makes it all seem so easy. Sometimes you think you know what you want, looking at these helps you take it up a notch, going from nice to beautiful!!! 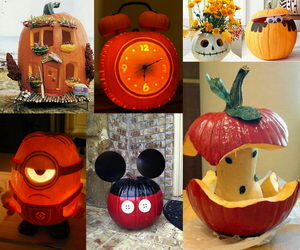 Wow, this is serious inspiration here, folks! 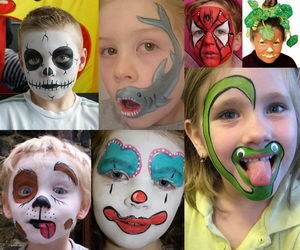 I pinned quite a few of these and will be using at least one of these ideas! Thanks! If anyone will consider my opinion then I can tell that dinner time is one my favorite time of the day. It is mainly because at this time every member of my family gathers around the table for a great repast. Thus, if the dining room is not in a good condition, then it will make the ambiance tiring and boring. Well, after going through your blog I also feel that make over is one of the finest ways to breathe new life into the room. Thus, everyone should makeover their dining room from time to time to make it spacious and more functional.